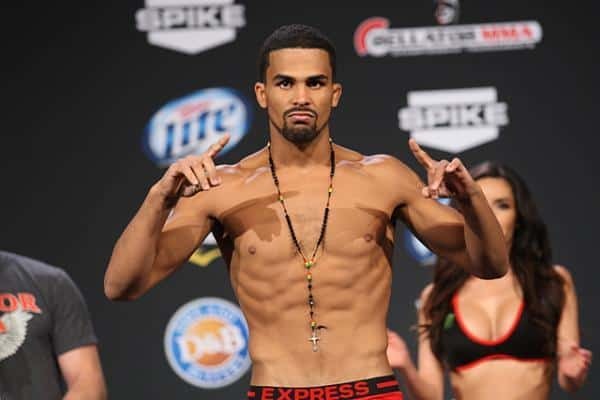 Jordan Parsons is a professional mixed martial artist who currently competes for Bellator MMA. Parsons was born in Fargo, North Dakota and spent most of his youth living in Michigan. Parsons, now 24-year-old, trains out of the Alliance Training Center in Chula Vista, California and holds a professional mixed martial arts record of 10-1. Parsons has competed in both the lightweight and featherweight divisions, defeating Tim Bazer via a vicious second round knockout in his Bellator debut at 155 pounds and will likely make his next appearance for the organization on May 15th at featherweight. Jordan has impressed so much so, that despite only having one fight in Bellator, he’s signed a new, substantial six-fight contract with the organization. MMA Discussion Podcast hosts Nick Peralta and myself had the opportunity to speak to Jordan about his background, training at Alliance, his recent injury, PEDs in MMA and much more. Listen to full interview with Jordan here. Jordan, I’m actually kind of curious, where did the nickname “Pretty Boy” come from? Well, I started MMA back when I was 17, I used to come to the gym, I was still in high school then, I would be all dressed up and I had just gotten my ears pierced at the time. In the beginning of practice when we were doing the warm up and everything I just wouldn’t take them out and eventually my coach just started calling me that, and it just kinda stuck, ya know? Looking you up, trying to get ready for the interview, I couldn’t find much about you. I know that you’re from North Dakota and now you’re training up in California at Alliance. Tell us a bit about yourself. What got you started with fighting? Did you wrestle in high school or anything like that? Yes sir. I wrestled in high school. I actually was born in North Dakota, but I moved when I was about eight years old and lived in Michigan and that’s where I got my start in MMA. I started wrestling in eighth grade and I started picking up on that pretty quick. I was a two-time state qualifier and I got recruited by a couple of colleges, but my senior year I had kind of a disappointing state run and it kind of pulled me away from wrestling for a little bit and I found MMA and then when I realized I could punch people and do takedowns, I didn’t really want to go back to just wrestling. From Michigan, I was there for a couple years and I trained up at college with a couple of guys and then eventually I decided I wanted to take it to another level. So I ended up in Minnesota, training there with Greg Nelson and a bunch of those guys. I stayed until last year and then I moved out here (California), just always trying to learn more and take my training to the next level. How is it that you wound up at Alliance? Well actually there’s a guy out here named Paul Bradley that’s in Bellator as well and I trained with him back in Minnesota, I was just talking to him about it and he was telling me good things about it. I read up on it and seen there was a bunch of great guys around my weight class and I decided to just go for it, just packed up and moved one day. Being out there at Alliance, it’s known for guys like Michael Chandler, Dominick Cruz, you’ve got Myles Jury up there, Jeremey Stephens. What’s it like training with those guys, if you do train with them frequently and what have you learned from them? Oh, a ton from them. A lot of people here have great footwork, your Myles Jury’s, your Dominick Cruz’s. You know, you have Michael Chandler, just a straight beast all-around, you’ve got Jeremy Stephens throwing heat at you the whole time. It’s really great, you always get different looks and they’re looks from the highest level, you’re not going to ever have a round where you’re like ‘alright, I’m going to be able to rest this round,’ it’s always push, push, push and great technique sessions. You have so many people from around the world that come here and around the country that show stuff from back home or wherever they may have learned a little technique along the line and you get to mesh all that together, it’s a great thing and I’m glad be be a part of it. You’re coming off of an incredible knockout in your last fight, your debut at Bellator, but that fight happened in April, but that fight happened in April, it’s been a long layoff off for you, what’s all the time off been like, and what is that attributed to? I got a torn meniscus during that fight and it ended up being a lot worse than they thought originally. Originally they told me I was going to be out for two weeks and then they put me under and they cut me open and they seen it was a lot worse than the MRI showed, so they had to stitch me up and when they woke me up they told me it was going to be 6-8 months. Hearing that right away was kind of tough, but after a little while and having people around like Dominick Cruz, who has been battling injuries, and just staying in the gym and just watching everybody, it made the time go by a little quicker. It always makes me real hungry when I have time off like this to fight again, but I guess I get the opportunity to work on my techniques and just get better. That’s awesome. It seems like you’re back in the gym already, how’s the injury coming these days? Oh, we’re good now. My knee actually kinda feels better than ever to be honest. I don’t know if it’s just something mental now or what, but it feels great. I’ve been training full now for a couple of months, just getting ready to get back in there, coming off that win it just amped me up even more to put my hands back on somebody else. That’s good to hear! Did that injury happen in the fight or in training leading up to the fight? Oh, it happened in the fight. I don’t know, it was just something weird, it must’ve been in the first round and it was just a little tweak because I didn’t really feel it in the fight; it must’ve been the adrenaline, but afterwards it was just sore and kind of throbbing so I went and had the doctor check it out and a couple weeks later it just started feeling worse. The doctor told me it was a good thing I hadn’t been training after the fight ’cause it might have ripped off all the way. So, it was a partial tear? On one side it was fully torn. On the inside it was like a partial tear, on the outside it was like a whole flap had come off and it was just hanging on by a thread. What’s the timetable looking like for your next fight in Bellator? Well we’re supposed to be shooting for May 15th, I’m just waiting on my opponent to sign the bout sheet, I think he’s had it for three weeks now or something. I’m just ready to get back in there as soon as possible, that’s the date they’ve given me at this point so I’m just preparing for that. The guy’s like 30-0 or something, so I’m pretty excited to get back out there and it’ll actually be at my natural weight class, which is 145 pounds, my last one was just one weight class up. So you generally fight down at 145? Yes sir. I had different management before and I switched management to get me back to my regular weight class, and just the small stuff outside of the cage that most people don’t really see. When was the last time you actually fought at 145? Have you fought at ’55 your whole professional career? No, I actually did a 145 tournament for an organization that’s no longer around called the CFA down in Miami, Florida. It was like an undefeated tournament and I won that and then I had to defend my belt and I lost that fight. That was the last time I fought at 145 and that was about two years ago. Then I had one fight, I think it was a little over a year ago and that was at 150. But, my weight is fine, when I made 155 it was super easy, so I’m not too concerned about the time off. What are you walking around at right now to make ’45? Well I diet constantly and when I’m doing that I walk around at 170-173 pounds and during fight camp I’ll walk around at about 168, and when it gets closer I’ll start dropping my weight down gradually. The majority of it comes off in water at the end. As far as dieting, is there a specific one you go with? One that you’ve adapted to at all? I guess I’ve just figured out what my body reacts to over the years and have just fine tuned it in. I stay away from really greasy foods, as far as meat goes I only really eat chicken and a ton of vegetables, your kale, spinach and all that, your broccoli, all your leafy greens and quinoa, brown rice, it’s pretty basic. I just try to stick to it, stay on it. I don’t go out, I never eat fast food, you’re not going to catch me with a soda in my hand, I don’t drink juice, nothing but water. I’ll have coffee on occasion and I don’t even really put creamer in that, I’ll use honey and almond milk to give it a little flavor. I just try to stay away from high sugars, I stay away from high fructose corn syrup, all those additives in everything. I take a lot of Garden of Life supplements and that’s helped me a ton, theirs is all-natural and vegan, I love it. That sounds like my diet right now. I’m probably going to be cutting weight in the next few months for my first Jiu-Jitsu tournament. What advice would you have for someone like me who’s trying to cut weight? Well really it just depends on what your target weight it and what your body fat percentage is. In the beginning, it’s all about just keeping your diet super clean so that you can get all the fat off as possible, and at the end for your last cut, you want to make sure that’s all water. For the last couple of weeks I’d start lowering your sodium, and for the last week I cut out my sodium completely, as much as possible and I don’t even really eat regular salt, I only eat Himalayan pink rock salt on anything that I eat and I make my own food too, so it helps. When people say it’s hard to diet it’s usually only tough for the first couple of weeks and then you forget what a lot of that other stuff tastes like, you don’t even crave it anymore. I just say stick to it, stick to everything you’re doing and make sure you’re exercising on a regular basis, for me road work is huge, I constantly have to be jogging every day whenever I’m in fight camp, just to make sure that my weight’s good. I like to do it for a mental push too, at the end of the day I’m tired, but I still have more in me, I can still bust out three miles pretty quick. You seemingly came into MMA with a grappling background, what do you attribute most of your striking improvements to thus far? Just staying in there and staying on it. You know lots of pad work, lots of time on the bag and just lots of footwork. Lots of focus on minor details. The grappling has come easier to me I feel than the striking aspect of it, so it takes pretty much just time I’d say, just time and focus. Committing myself all the way into it, watching people, learning little techniques. Like after a sparring session I’m gonna ask what I was doing well, what wasn’t really working. I try to meet with all my coaches once a month and write down what I should be working on and what they want to see me improve on and what things I did well and then go from there. I just really try and stay a student of the game at all times. You can always learn from someone, something, just the moment you stop trying to learn, I feel like that’s when you’re going to plateau. I wanted to ask you, since you’re signed with Bellator, and they’ve been making changes these days, one of them being that they no longer go with tournaments, are you happy about that or would you have liked to participate in one of those? I think it would’ve been fun to do the tournament ’cause it’s a quick rise to the top, but at the same time I can see why they got rid of it because now they’re given an opportunity for higher ranked guys to have a chance to go for the belt. Like Georgi (Karakhanyan) at 145, that guy was a multiple time world champion in other organizations and he got to come over and fight once and now he gets a shot at the belt, whereas he might have been in line before behind three other people because they were behind on tournaments. Aside from the tournaments, have you felt the affects since Bjorn Rebney left the company and Scott Coker took over? Well I actually went and attended one of the shows they had in San Diego and the production value was awesome. There were great fights and even the walkouts for every fight and hyping it up in between, it was great, it seems like people would be more excited to come to those shows now. I haven’t had an opportunity to fight yet, but it seems like things are going pretty well and it was a smooth transition. Since you’re competing now at 145, who are you most looking forward to competing against in the near future? I want that belt man, I don’t really care who holds it and I don’t really care who’s in the way on the way, but that belt, I consider that mine and somebody’s just keeping it warm until I get there. I’m here to fight the best guys and beat ’em, that’s what I’ve been training for, every fight that I fight now, I feel like I’ve been training years for that specific fight. Barring any injuries, how long do you think it would take to earn yourself a title shot? Well that’s really up to the company and my management and the way that things go. I try to stay out of the extra part of it so that I can focus strictly on training and getting better. I’d like to be a champion within the next couple years, or get my shot. But that’s really up to the organization. 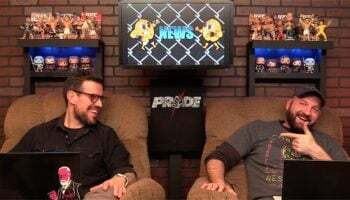 We know Bellator is a good organization, you get on Spike TV, but to a lot of guys it’s not the ultimate goal, the ultimate goal is the UFC, is a UFC title. What’s your ultimate goal in the sport? My ultimate goal in the sport is to just be one of the greatest. I don’t really care where I’m fighting, I just want to know that I’m fighting the best people possible. I want to beat everyone who is considered the best, that’s the only way you can be the greatest in my opinion. I don’t train this hard and focus this hard to fight just some guy. I’m looking to have my opportunity at the best people in the world no matter what organization they’re in. Do you think that’s going to take going to the UFC to accomplish? I’m not sure because there’s a lot of new things going on, you know? You got Bellator, you got your ONE FC out there, you got World Series (of Fighting). It’s so spread out now, it’s hard to really say universally who is the greatest, because you can bring a guy over from one organization and they can dominate everyone and vice-versa. There’s been a lot of controversy thus far with PEDs, mostly attributed to the fighters that have popped in the UFC. Since you are signed with Bellator, what’s the drug testing like for Bellator specifically, if at all? The one fight that I had, I don’t think that I got tested. I’m not exactly sure how they do it. I’m pretty sure they do the main card, or the main events always get tested on each show, but I haven’t been put in that position. I have been drug tested in other organizations, but as far as Bellator, I’m not 100 percent sure yet seeing how I’ve only fought once. Thanks again for coming on Jordan, do you have anyone you want to shout out and where can people find you on social media? Thanks for having me guys, I really appreciate it. On social media you can find me @prettyboymma_jp, that’s on Instagram and Twitter. 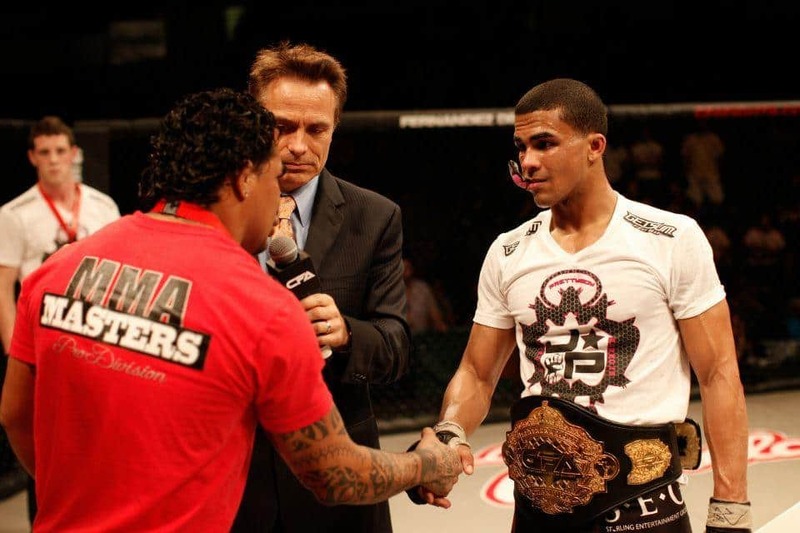 For my Facebook you can just search my name, Jordan Parsons and I also have a website, JordanParsonsMMA.com where you can check out when I get some gear up there and see all of my social media feeding through that and any videos and pictures and stuff like that, check it out. And I just want to thank everybody for taking the time to listen. I know that I’m relatively new in the sport and I haven’t really done too much yet, but I promise you, things are coming and things are changing and one day my name will be a household name.